I am sure I am not alone in having favorite subjects to share with my children. Math and science? Painful for all of us! Literature and history? Ah, delightful! Grammar? I love grammar especially diagramming sentences. However, my children do not share this love. Due to this, for several months I had spent time researching different grammar resources for my son. When Analytical Grammar allowed me to review Analytical Grammar along with the Analytical Grammar Companion DVDs, I hoped that my quest for a grammar program we could all love was over. Analytical Grammar was designed by Robin Finley to teach grammar to students in a systematic method. After 34 years of teaching language arts, Mrs. Finley realized that instead of teaching grammar year after year, waiting to teach grammar in the upper years proved more beneficial and effective. I must say that after many years of homeschooling, I agree. 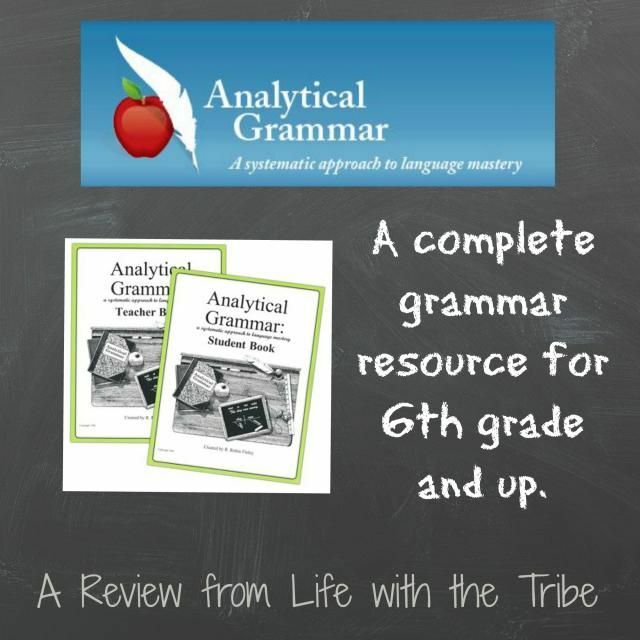 Analytical Grammar works with students in Sixth Grade or higher. Depending on the level of your student, Analytical Grammar has different time schedules for working through the program: one year, two year, or a three year schedule. For example, my twelve year old son will most likely follow the three year schedule. If I were to have my fourteen year old daughter use the course, I would put her on the one year schedule. Analytical Grammar consists of two books: teacher’s book and the student book. Naturally you would purchase a student book for each student as the text is copyrighted. The Teacher Book explains to you how the three year schedule works. The program is broken down into “three seasons” and one season would be covered each year. Mrs. Finley also shares how to handle the three seasons if you progress faster than three years. A suggestion for how to implement Analytical Grammar at a pace that would cover a unit per week is given. Naturally you can flex the program to fit you and your student. Teacher notes with helpful hints and information are included as well. The Teacher Book has the same lesson information as the student book except the teacher book has answers marked.There are 35 units in this course. Each unit has a page explaining the topic covered. Then the student has three exercise pages to complete. A Skills Support exercise is also in the unit. For this exercise, the student is asked to paraphrase some text and then mark the parts of speech they have covered up to that point. For example in Unit 1, a line from the Pledge of Allegiance was given. The student would mark the parts of speech for that selection and then paraphrase. To wrap up the unit a test is given. Mrs. Finley recommends allowing the student to have an “open notes” test. The Student Book contains all the explanation pages, exercises and tests. This book is designed to be written in and has perforated pages. This references back to the “open notes” testing. The student is encouraged to remove the teaching notes pages and put them in a binder to create a Grammar Notebook for future reference. This way throughout the coming years, your student has a reference guide to help him in his writing. The program is designed for the teacher to spend 10 – 15 minutes going over the teaching notes together. Perhaps, after going over the notes, working a sentence or two together to make sure understanding is there. Depending on the age/ability of the student, this could be used as an independent study in my opinion. There is adequate practice given in each exercise. Analytical Grammar Companion DVDs, which we also reviewed, would work well to fill the gap if the child needed instruction but also needed grammar to be independent study. The DVDs have video instruction for each unit in the course. In the video lessons, either Mrs. Finley or Erin Karl (co-author), explain the teaching notes. After covering the teaching notes, she then walks the student through a few examples. Another helpful aspect is that after going through examples together, Mrs. Finley (or Erin) pause and give the student the opportunity to work a sentence on his own. Then she goes over that sentence before the student works the rest on his own. The DVDs maintained the simplicity of the program and are very easy to use. Sample pages and pre/post tests are available. You might also want to look at How It Works and FAQ. 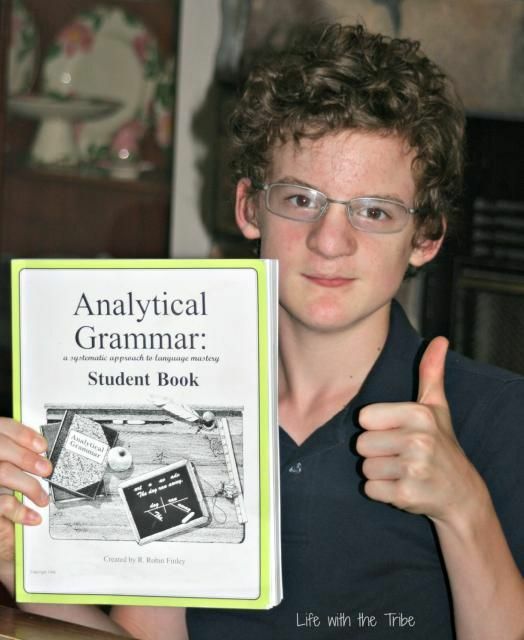 My son, Caleb, has been using Analytical Grammar for several weeks. He had a few years of grammar in the elementary grades which proved to be fruitless. He retained very little from those lessons. A couple of years ago, I decided to not cover formal grammar until the children were older. Analytical Grammar works perfectly with that mindset. In all honesty, Caleb has hated grammar. He was more than happy for me to take my time selecting a grammar course for him. Needless to say he was less than enthusiastic about Analytical Grammar. However, after the first day, his mind was changed. Evidence of this change? Caleb does his grammar without me telling him to and he doesn’t complain about having to do it. Not only is he doing grammar, but he is doing it well. The set up of Analytical Grammar is perfect for him. The teaching notes don’t ramble on and the exercises are not overwhelming. The one aspect that Caleb does not prefer is the Skill Support page. He has had a few stressful days on paraphrasing some of the text. That is ok. We all need a good challenge now and then. Even though he doesn’t like that portion of the units, he is getting better at it. Progress is golden! Caleb also appreciated the DVDs. He found the teaching instruction easy to understand and follow. He commented on how the instructors didn’t talk down to you or over your head. They knew exactly how to explain the material. To him, the instructors explain things like mom. While I had planned for Caleb to use the DVDs for all the lessons, we actually switch from me working with him to using the DVDs. He prefers to go over the lessons with me and since I enjoy grammar, I don’t mind. However, with a newborn and other little ones in the house, flexing is key! On those hectic days, he pops in the DVD and keeps moving ahead. They have been a life saver for us. Analytical Grammar and the DVDs definitely get a thumbs up. The program is easy to implement, easy to use, and effective. I am thrilled to have a program that works and that my son actually enjoys. ** I must add that for a family on a tight budget, the pricing of Analytical Grammar is a bit steep. The pricing would have kept me from making a purchase. A downloadable version of the student text or reproduction allowed would be helpful for families with multiple children using the program. However, it is an excellent resource that you should consider. Don’t take my word for it! Other Schoolhouse Review Crew members used Analytical Grammar and other resources as well. Go check a few out! 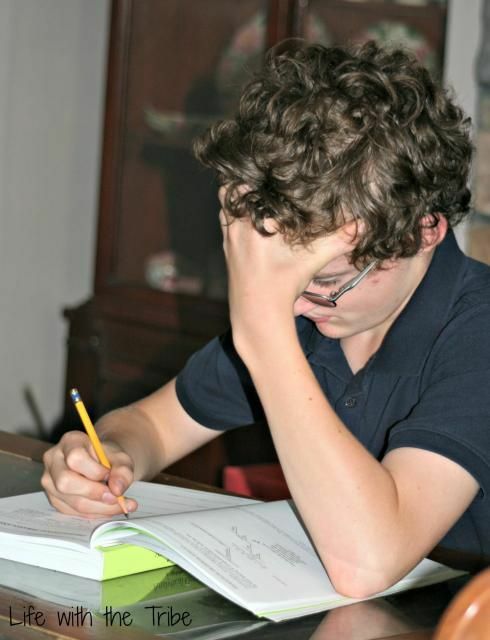 This entry was posted in High School, Homeschool, Something to Share, The School Table, TOS Crew Reviews and tagged boys, curriculum, Homeschool, review by sweetie. Bookmark the permalink. We used this two years ago. We will do Year 2 this year (didn’t use it last year as it was packed away). I wonder if the DVD’s would help. They didn’t offer DVD’s when I bought it.